This is “Rational Exponents”, section 8.5 from the book Beginning Algebra (v. 1.0). For details on it (including licensing), click here. Write expressions with rational exponents in radical form. Write radical expressions with rational exponents. Perform operations and simplify expressions with rational exponents. Perform operations on radicals with different indices. Furthermore, we can see that 21/3 is one of three equal factors of 2. In other words, the denominator of a fractional exponent determines the index of an nth root. Example 1: Rewrite as a radical. Example 2: Rewrite as a radical and then simplify. Example 3: Rewrite as a radical and then simplify. An expression with a rational exponent is equivalent to a radical where the denominator is the index and the numerator is the exponent. Any radical expression can be written with a rational exponent, which we call exponential formAn equivalent expression written using a rational exponent.. Example 4: Rewrite as a radical. Example 5: Rewrite as a radical and then simplify. b. We can often avoid very large integers by working with their prime factorization. Given a radical expression, we will be asked to find the equivalent in exponential form. Assume all variables are positive. 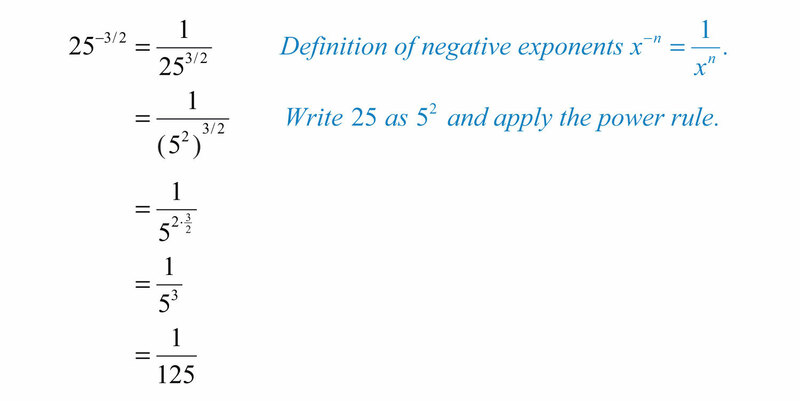 Example 6: Rewrite using rational exponents: x23. Example 7: Rewrite using rational exponents: y36. It is important to note that the following are equivalent. Example 8: Rewrite as a radical and then simplify: (−8)2/3. Try this! Rewrite as a radical and then simplify: 253/2. These rules allow us to perform operations with rational exponents. Try this! Simplify: (8 a 3/4 b 3)2/3a1/3. To apply the product or quotient rule for radicals, the indices of the radicals involved must be the same. If the indices are different, then first rewrite the radicals in exponential form and then apply the rules for exponents. Solution: In this example, the index of each radical factor is different. Hence the product rule for radicals does not apply. Begin by converting the radicals into an equivalent form using rational exponents. Then apply the product rule for exponents. Solution: In this example, the index of the radical in the numerator is different from the index of the radical in the denominator. Hence the quotient rule for radicals does not apply. Begin by converting the radicals into an equivalent form using rational exponents and then apply the quotient rule for exponents. Example 16: Simplify: 43 . Solution: Here the radicand of the square root is a cube root. After rewriting this expression using rational exponents, we will see that the power rule for exponents applies. When converting fractional exponents to radicals, use the numerator as the power and the denominator as the index of the radical. All the rules of exponents apply to expressions with rational exponents. Use a calculator to approximate an answer rounded to the nearest hundredth. 63. Explain why (−4)^(3/2) gives an error on a calculator and −4^(3/2) gives an answer of −8. 64. Marcy received a text message from Mark asking her how old she was. In response, Marcy texted back “125^(2/3) years old.” Help Mark determine how old Marcy is. 115.	Who is credited for devising the notation for rational exponents? What are some of his other accomplishments? 116. When using text, it is best to communicate nth roots using rational exponents. Give an example. 63: In the first expression, the square root of a negative number creates an error condition on the calculator. The square root of a negative number is not real. In the second expression, because of the order of operations, the negative sign is applied to the answer after 4 is raised to the (3/2) power.